One of the key “aha” moments on my road to recovery from Hashimoto’s came when I decided to try taking a betaine with pepsin supplement to support protein digestion and woke up the next morning with more energy than I had felt in a decade! As I’ve delved more into the world of food pharmacology (food as medicine), I’ve come to realize how important proper digestion is to health, particularly for those of us managing thyroid conditions. People with Hashimoto’s usually experience some level of nutrient deficiencies, food sensitivities, digestive issues, and infections, in addition to an impaired ability to handle stress and a toxic overload. These symptoms are often caused by a diminished ability to absorb proper nutrients from the food we eat. This is where digestive enzymes that help the body break down food can be a critical tool for improving digestive health, boosting nutrient uptake, and reducing the symptoms of Hashimoto’s. What type of enzymes are best to take? The answer depends on the symptoms you are experiencing and the types of foods that are problematic for you. There are five types of digestive enzymes that are helpful for Hashimoto’s, but in this article, I will focus on vegetable digestive enzymes, which are used primarily after the consumption of vegetables, especially those that may be difficult to digest due to their high starch and fiber content. In a well-functioning gut, the body produces the appropriate enzymes to break down the food that is ingested. Enzymes such as amylase and maltase begin their work in the mouth as food is chewed. Further enzymes, such as lipase and lactase, are released by the stomach, pancreas, and small intestine to break down the food particles as they move through the digestive tract so that they can be absorbed by the body. However, compromised intestinal function is almost always a factor in people with Hashimoto’s, and oftentimes, the root cause of their thyroid condition. 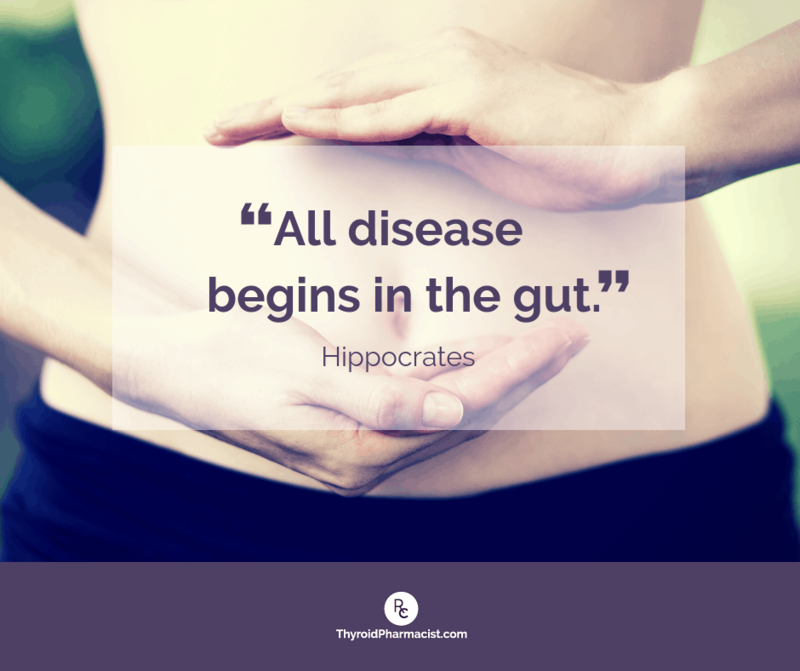 When the intestinal walls become damaged due to a variety of possible culprits, including high levels of stress, toxins, infections, a deficiency in enzymes, and food sensitivities, the body becomes unable to absorb nutrients due to the intestines’ inability to break down certain foods. Not only will the person become lacking in key nutrients, but those undigested food particles may damage the intestinal lining, causing or exacerbating intestinal permeability, or leaky gut syndrome (a precursor to autoimmunity). When toxic substances permeate the intestinal lining and become absorbed into the bloodstream, the body may recognize them as foreign invaders. This causes inflammation in the body as it begins to attack the intruders, and eventually leads to autoimmunity. When food particles are poorly digested, we are also more likely to become sensitive to them. People with Hashimoto’s are particularly prone to be sensitive to gluten, dairy, and soy because these proteins are amongst the most difficult to digest and are also the most commonly eaten proteins in the Standard American Diet. When foods that a person is sensitive towards are ingested, they will develop IgG antibodies, which are the same types of antibodies that target the thyroid gland in autoimmune disease, towards these foods. With regular consumption, the immune system attack becomes upregulated as the influx of poorly digested foods triggers the immune system to make more of these types of antibodies. That said, there are ways to improve one’s digestion. Supplementing with the proper digestive enzymes can aid the body in digesting food, thereby increasing nutrient absorption and boosting gut health. In fact, a 2008 study published in the Alternative Medicine Review found that supplementing with enzymes provided a safe and effective treatment for various digestive orders, including lactose intolerance, celiac disease, and other digestive malabsorption disorders. Again, this article will be focusing specifically on vegetable digestive enzymes. We all know how important it is to eat our vegetables. In fact, many of my recommendations for healing the body through nutrient-dense whole foods revolve around fueling the body with nourishing green vegetables. But for some people with Hashimoto’s, a damaged gut and a lack of digestive enzymes can make vegetables difficult to digest, as their high fiber and starch content may be difficult to break down, especially in their raw form. A 2009 study published in the World Journal of Gastroenterology found that conditions related to thyroid abnormalities, including both hyper and hypothyroidism, can be associated with digestive issues. While all the mechanisms and causes behind these digestive issues are not completely understood at this time, researchers have found that hypothyroidism can delay gastric emptying, and severe cases may lead to disturbances in esophageal peristalsis (which causes large pieces of digested food to be rapidly pushed toward the esophagus by the pharyngeal constrictor muscles). Given that up to 15 percent of hypothyroid patients have fewer than 3 bowel movements weekly, the study emphasizes the need for practitioners to recognize that digestive issues can be related to thyroid conditions. In some cases of hypothyroidism, an indigestible ball of plant fiber material known as a phytobezoar, which is formed out of undigested vegetable fibers, has been found to cause bowel obstruction. These masses of undigested material commonly consist of vegetable fibers from pulpy fruits, orange pits, seeds, roots and leaves, but can be formed from any indigestible food fibers. Fibrous foods that are often found in phytobezoars include celery, pumpkin, prunes, raisins, leeks, beets, persimmons and sunflower-seed shells. Gross, right? A 2018 study in the Journal of Surgery Case Reports documented an 11 year-old boy who was admitted to the hospital for a bowel obstruction and subsequent surgery to remove the mass from his small intestine. After examining the mass and questioning the boy, it was discovered that he had eaten a large quantity of oranges, including the membrane, a few days earlier. This had caused the mass of undigested fruit fiber to form in his intestines. The authors of the study noted the importance of avoiding large amounts of plant fibers and chewing food thoroughly! While the boy was not noted to have a thyroid condition, this study highlights the importance of proper fruit and veggie digestion. Interestingly, insoluble fibers, which are high in vegetables like leafy greens, corn, celery, and bell peppers, have been shown to mechanically trigger symptoms of irritable bowel syndrome (IBS) as they move through the digestive tract. However, certain fibers — particularly soluble fiber such as psyllium — may actually be a helpful treatment for IBS. So perhaps the inability to digest the insoluble fibers is due to an enzyme deficiency, further contributing to the autoimmune cascade and IBS symptoms. Common symptoms of poor veggie digestion include bloating, gas, constipation and stomach pain. Symptoms of nutrient depletions that may occur when the body is unable to break down and absorb the nutrients in fibrous vegetables are much further reaching and may include fatigue, hair loss, muscle pain, and autoimmunity itself. Deficiencies in antioxidants such as vitamin C (which is found in high amounts in cruciferous vegetables, bell peppers, and leafy greens), vitamin E, beta-carotene (a vitamin A precursor), and the minerals selenium and manganese, often result due to poor vegetable digestion. Folate is another important nutrient that can become depleted when vegetables aren’t properly absorbed. Common sources of folate include broccoli, asparagus, avocado, spinach, and brussels sprouts. Getting enough folate from food sources is particularly important for those with the MTHFR gene variation, and can become challenging when veggie digestion is compromised. You can read more about the most common nutrient deficiencies found in those with Hashimoto’s here. I’d like to share some strategies to help you overcome veggie digestion issues so that you can help your gut heal, eliminate your symptoms, and prevent nutrient depletions. Cook raw vegetables – Raw fruits and vegetables can be difficult to digest if you have leaky gut, which is why you may need to focus on eating well-cooked foods in the early stages of intestinal healing. The process of heating and/or puréeing vegetables softens some of the tough fibers, rendering them more easily absorbed. (It also breaks down the goitrogenic potential of cruciferous vegetables, and you can read more about that in my article on goitrogens and Hashimoto’s.) Once these are tolerated, you can try to work your way back to raw vegetables with the peel. Start by adding in some raw, peeled and puréed vegetables, then progress to raw peeled fruits and vegetables, and eventually try the unpeeled variety. As you begin reintroducing raw fruits and veggies, you may benefit from vegetable-digesting enzymes, which we’ll discuss in a minute. Chew thoroughly – Enzymes are present in the mouth, and the act of chewing food begins the process of breaking it down so it can be absorbed by the gut further down the line. Drink smoothies or vegetable juice – By blending or juicing the vegetables, the fibers are broken down or extracted for easier digestion. I drink a Root Cause Green Smoothie every morning because it adds an easily absorbed dose of fiber, antioxidants and micronutrients to my diet. For those who experience bloating and abdominal discomfort after consuming vegetables, or who have noticed undigested vegetable fibers in their stool, a vegetable digestive enzyme that contains fiber-digesting enzymes may help you feel better. Cellulase, an enzyme that converts cellulose into glucose, is essential for breaking down vegetables, but it’s not naturally produced by the body. Amylase breaks down starches to help the body digest starchy and fibrous foods like raw veggies and fruits. Diastase, an enzyme that can be found in malt and raw honey, works to break down starches and turn them into glucose for absorption. Glucoamylase breaks down the starches in vegetables, rendering them absorbable by the body. Alpha-Galactosidase breaks down sugars in complex carbohydrates to relieve intestinal gas and bloating. Hemicellulase breaks down hemicellulose, a type of cellulase and component of the cell wall in all plants. Invertase catalyzes the breakdown of sucrose (table sugar), especially in high-sugar containing vegetables like corn and beets, which are then converted into fructose and glucose. Taking these types of enzymes may help reduce gas, bloating, and constipation after vegetable-heavy meals. I formulated the Rootcology Veggie Enzymes supplement with a specific combination of enzymes, including cellulase and amylase, to help with this process. It also contains the enzymes protease, lactase, lipase, and phytase to help break down proteins, grains, and fats for optimal digestion. I recommend taking one capsule with every meal that is high in vegetables — but be sure to consult with your practitioner before starting them to tailor the dosage to your individual needs. Getting to the bottom of your own digestive issues can take some time and perseverance, but it is a crucial step toward recovering from Hashimoto’s and thyroid disease. 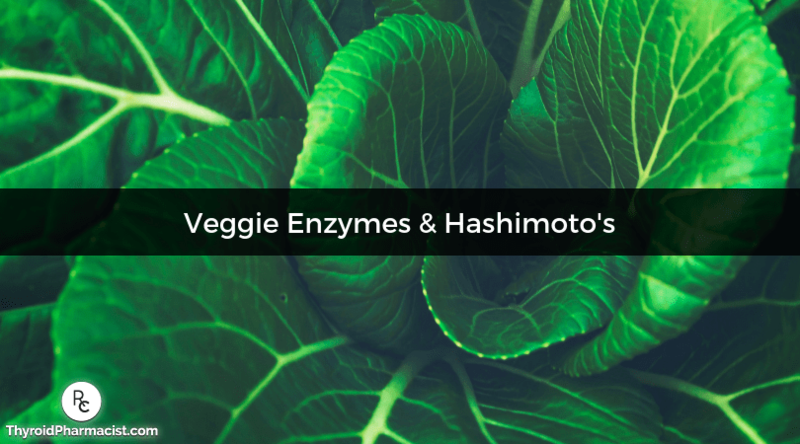 Veggie enzymes have many benefits that can help to relieve many of the symptoms that are experienced with Hashimoto’s, such as constipation, gas, bloating and abdominal pain. As a bonus, improving one’s absorption of veggies can help increase their absorption of vitamins and minerals and, in turn, address underlying nutrient deficiencies. If you are experiencing bloating, gas or abdominal pain when you consume fibrous vegetables, supplementing with a veggie enzyme formula (like the one from Rootcology) could help you boost your nutrient absorption and allow you to enjoy that spinach salad! For issues with low stomach acid, I invite you to take a look at my article about the benefits of betaine with pepsin. I’ve also written an article that covers other types of enzymes that you may find beneficial in addressing digestive difficulties that are often times present with Hashimoto’s. You can learn more about the healing potential of food with my new cookbook, Hashimoto’s Food Pharmacology: Nutrition Protocols and Healing Recipes to Take Charge of Your Thyroid Health. In this book, I give my readers a crash course on how to heal your body with nutrition, filled with recipes and eating strategies that are easily incorporated into your daily life. All the recipes remove the most harmful trigger foods and incorporate beneficial foods to help your body heal and your thyroid thrive! I hope this information is helpful for those of you who’ve had trouble digesting your veggies. Restoring gut health is a huge component of getting Hashimoto’s into remission, and taking the appropriate digestive enzymes to assist your body in processing food and absorbing nutrients can help immensely. As always, I wish you well on your journey to feeling your best! For continued updates and interaction, please become a part of our Facebook page. I love interacting with our readers! Also, be sure to sign up to my weekly newsletter to get a free book chapter from my book Hashimoto’s: The Root Cause, recipes, Thyroid Diet start guide and notifications about upcoming events and my latest research. Fasano A. Leaky gut and autoimmune diseases. Clin Rev Allergy Immunol. 2012;42(1):71-78. doi:10.1007/s12016-011-8291-x. Kvantchakhadze R. Wobenzym in the complex treatment of autoimmune thyroiditis. Int J Immunorehab. 2002;4(1):114. Bezoars: What Food Can Cause This Digestive Problem? Mayo Clinic. https://www.mayoclinic.org/diseases-conditions/gastroparesis/expert-answers/bezoars/faq-20058050. Accessed December 16, 2018. Tatekawa Y. Food ileus secondary to citrus fruit associated with a Meckel’s diverticulum: a case report and review of the literature. J Surg Case Rep. 2018 Mar 28;2018(3):rjy057. doi: 10.1093/jscr/rjy057. Roxas M. The role of enzyme supplementation in digestive disorders. Altern. Med. Rev. 2008;13(4):307–314. Bijkerk CJ, Muris JW, Knottnerus JA, Hoes AW, de Wit NJ. Systematic review: the role of different types of fibre in the treatment of irritable bowel syndrome. Aliment Pharmacol Ther. 2004;19(3):245-251. Daher R, Yazbeck T, Jaoude JB, Abboud B. Consequences of dysthyroidism on the digestive tract and viscera. World J Gastroenterol. 2009;15(23):2834-8. Jessica – thank you so much for sharing. I an happy to hear you are feeling better. I am very hesitant in recommending iodine in Hashimoto’s. Although iodine serves as fuel for our thyroid and is very important in iodine deficiency hypothyroidism, Hashimoto’s is a different mechanism. It’s like pouring gas into an engine that’s on fire… that’s essentially what’s happening in Hashi’s, thyroid inflammation. Adding iodine to the mix before putting out the fire and fixing the engine may result in further damage to the thyroid. In those with a predisposition to autoimmunity, this has been documented time and time again, in animal and human studies. I have spent 4 years researching about this issue, and have seen too many people suffering the consequences of adding iodine too soon. My approach is, let’s fix the engine first (usually a gut issue), and then add the fuel once we know that the engine is no longer on fire. Hope that you will check out my books. I do have a chapter on the iodine controversy that references numerous studies as well as the work of Abraham and Brownstein. Here is an article you might find helpful. Jeanne – thank you so much for reaching out and sharing your journey. I am so sorry you are struggling with all of this. My heart goes out to you. <3 The reality is, most people with acid reflux have low acid, not high acid. Depletion in the vitamin B12 is often responsible for inadequate acid production. Furthermore, suppressing stomach acid prevents us from extracting iron and vitamin B12 from foods, resulting in yet another vicious cycle and leading to other digestive problems, anemia, hair loss, and even neurological problems. Here are a couple of articles that you may find helpful. Thank you for a great article. I wish you would explain how to take enzymes, Betaine, ox bile. What to take at beginning of meal, during or after? Nothing seems to help my bloating and I’m wondering if I am taking the supplements wrong. Thank you. Are there enzymes which are not recommended for those with fructose intolerance?